Lake Country - CCS Finishing Pad- 5.5"
Lake Country CCS Finishing Pad- 5.5"
CCS technology™ (collapsed cell structure) solves this common problem using stategic patterns of partially closed foam cells.The face of a CCS pad is covered in strategically placed pockets. These pockets are locations where the foam cells have been closed. Polish does not absorb into these closed cell pockets, leaving more product on the pad's surface and on the paint. This polish-saving design allows wax to spread further because less product is absorbed by the applicator pad. Soft and firm. this ultra-soft wax applicators are completely nonabrasive and will deliver an even coat of wax or sealant every time. CCS Red Wax/Sealant Applicator Pads from Lake Country is made of incredibly soft, European finishing foam. These durable, CCS wax applicator pads withstand wax after wax and wash after wash.
Work on a small cool surface 18to24 inches square. Set the sealant for 1-2 hrs till its get dry, wipe off with Microfibre Cloth followed by final inspection to remove the residue. Don't use too much product Common mistake. A build up on a pad is counter-productive, and simply more to clean off later. Storing them wet in a zip-lock bag for re-use later. Brushing dried, excess product from the face of the pad using a nylon bristle brush, like a toothbrush for example. Lake Country CCS Wax & Sealant Pad Available in Blue, Red This soft, imported foam is ideal for applying the final coat of wax or sealant. The foam works especially well when applying liquid waxes or sealants because it is firm enough to keep the majority of the product on the paint, rather than soaking it up. The red foam has no cut or cleaning ability. CCS technology™ (collapsed cell structure) solves this common problem using stategic patterns of partially closed foam cells.The face of a CCS pad is covered in strategically placed pockets. These pockets are locations where the foam cells have been closed. Polish does not absorb into these closed cell pockets, leaving more product on the pad's surface and on the paint. This polish-saving design allows wax to spread further because less product is absorbed by the applicator pad. Soft and firm. this ultra-soft wax applicators are completely nonabrasive and will deliver an even coat of wax or sealant every time. CCS Red Wax/Sealant Applicator Pads from Lake Country is made of incredibly soft, European finishing foam. These durable, CCS wax applicator pads withstand wax after wax and wash after wash. Application Technique Attach Lake Country CCS Red Wax/Sealant Pad to the backing plate of Bosch Eccentric Sander Set the speed of a machine to approximately 1500-2000 RPM Apply the product directly to the pad Mist the pad very lightly with water and place the machine on thesurface and turn the machine on Work on a small cool surface 18to24 inches square. Go over the area in a left to right process. Continue the process till the work is finished Remove the product residue with the clean Microfibre Buffing cloth Suggestion Set the sealant for 1-2 hrs till its get dry, wipe off with Microfibre Cloth followed by final inspection to remove the residue. 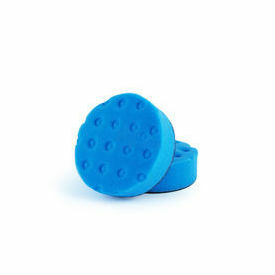 Polishing Pads Maintenence First, one of the reasons washing foam pads with detergents is not a good idea is due to the fact that some cleaning chemicals can change what is called "compression strength." In simple terms, this means the bounce-back or resistance of the foam to compression. After washing, with altered compression strength, the foam pad may not perform as it should. Below are the following tips to maintain the quality Wash pads as soon as possible. Use dedicated pads for each product Don't use too much product Common mistake. A build up on a pad is counter-productive, and simply more to clean off later. Tapping them when they are dry to knock loose any dried product Storing them wet in a zip-lock bag for re-use later. Brushing dried, excess product from the face of the pad using a nylon bristle brush, like a toothbrush for example.